Secondly, how manoeuvrable are they? finally, having read some builds they seem to push up one hell of a bow wash as the go along. Do they wallow or even sink because of this? Are there any plans showing things like ribs and such, or are they just shoe boxes? Springers do not generally need any ribs etc, the hull shape is very strong and self supporting. They will operate in more challenging water / wind conditions then most boats. Depending on what drive / rudder you use (ie: Kort Nozzle) will spin in almost its own length. As long as you have a deep coaming under the removable superstructure they are very water resistant. Another club member and I have been known to do a bit of springer sumo! This involves no holds barred attempts to sink each other...to date after a couple of dozen sessions, we have been close but we have both failed miserably!!!! One is 12v on standard prop, the other is 7.4 v on twin steerable korts and there is not much between them. Build one, have fun, and dont worry, they really are robust! I guess its having not long lost my seaport tug at sea (possibly the only man alive to have sunk a seaport tug!) I'm a little more cautious. There in I know much better than when I started that project a couple.of years back! Another question, if the hull is made a little shorter, is it still a springer? By way of encouragement, a photo of my little Springer at Black Park. Make sure you have freeing ports along the deck so water can flow back out. Look foreward to seeing your tug at Mayhem. The hull should be 18x8 inches, 540 motor max, 7.2V max and no Korts. It's early morning and this is from memory but I think it's right. However, UK 'Springers' come in all shapes and sizes and all specs. From 6 inches long to manic brushless. and lots of run time. There is a wealth of reading and knowledge in the Springer Section on here. 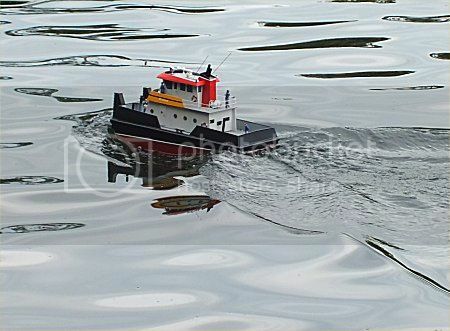 I have built a few springer's, the best one I built was built to the American standard, powered as Ned has said by two 6volt sla batteries wired in parallel, with the fillet on the back of the standard rudder. Could turn on its own length and was very powerful, might have to make another one for Mayhem. I had a coaming one inch deep around the access hole in the deck, and never got any water in the hull even at full speed with over an inch of water washing over the deck. I did not fit any edging to the deck, so the water cleared very quickly. If you make one forget about full throttle, that will just turn it into a submarine. If the dimensions are different to the standard, it ain't a springer.